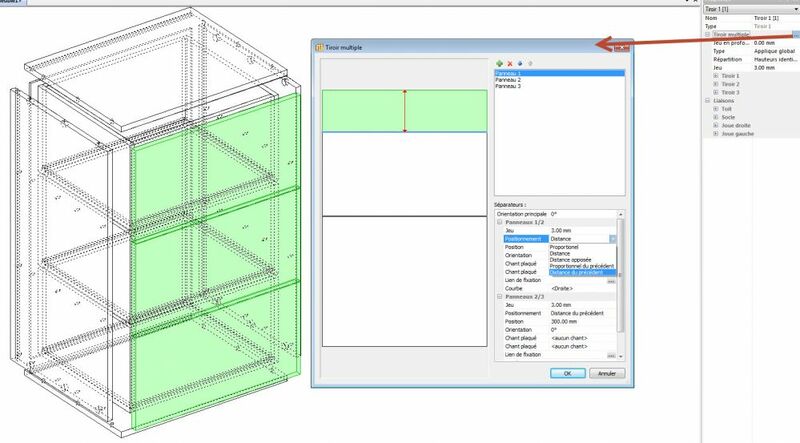 To edit a cabinet in Project Mode click twice on the cabinet and it will open in Cabinet Edit mode. You can now add fittings and resave in the project. 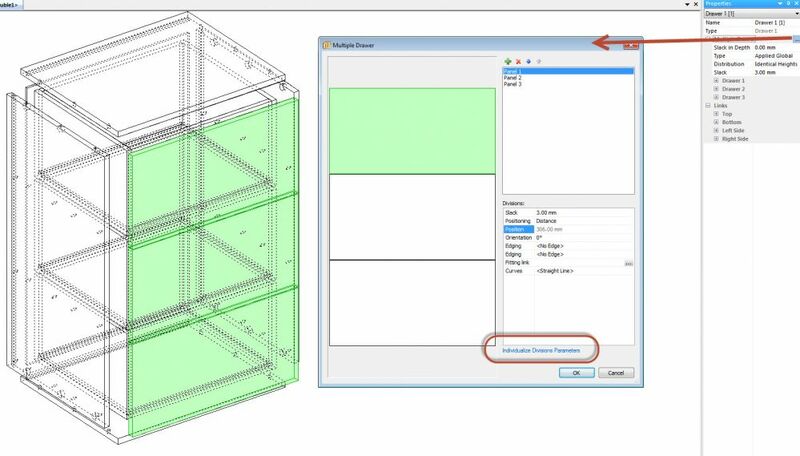 All those I can do in basic cabinet but not in project mode? Basic cabinet 600 mm width and add my drawer cabinets which have 1-10 drawersinside basic cabinet in same project too. But cant find out how to add fittings??? So I have make cabinet with drawer(s) and save and add fittings to cabinet. I need 1-10 drawers and 32 mm step. Simplify it now. So i have cabinet 600 mm width and inside 4 drawers each 187 mm height and 5 mm space top , bottom and each drawers and fittings assembled and save. and add my drawer cabinet 600mm and add it tot project too. I cant get add any fittings? I made my drawer file all sides ,top,back and bottom as nil just leave drawer parts and zone is 568 mm. 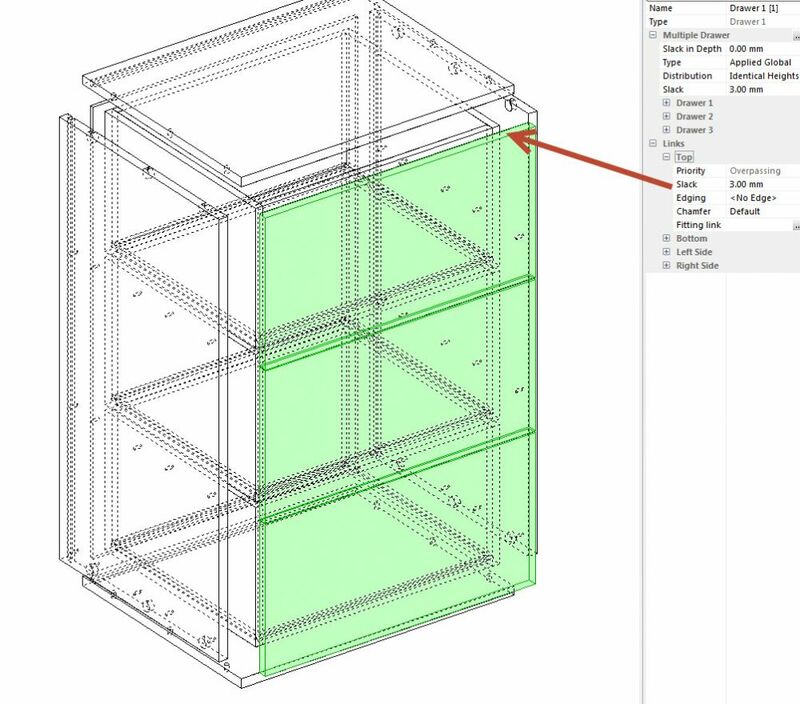 Drawers can be set up with different heights by using the edit drawers button. This dialog box also sets the space between drawer, however, the space around the drawers is set using the Links>slack options. The holes required to hang the runners should be set up as hardware that links the drawer front to the side using the inner zone as reference. The easiest way to do this is to set up a manufacturing method that adds the hardware automatically when you place the drawer. Drawer runners can not be hung from 32mm holes but must be drilled separately. I have a basic cabinet let say 600 mm and sides 16 mm so inside zone is 568 mm. I want to insert 1-10 drawers in zone that I have already save.There is different heights of drawers based on 32 mm like 219,187,160 and space between drawers 5 mm and space top and bottom also 5 mm. I start new project and add new cabinet and divides it uprights 2 zones. Then I add my drawer file based on zone 568 and try to accept fittings. Cant figure how to make those? Or is it impossible to make fittings in project mode? What is then the easiest way to add reassembled drawers(baskets) to cabinet ? It takes much time to add shelf to get right zone height and then change drawers sizes and do that job. I think there should be easier way to do this job surely?